Note: Comments posted after April 27th, 2005 may reflect Combat Upgrade or NGE information. 2:40:00 AM Cowering Vigilance L3. WP 2860 -2724 Wild Lair. 7:12:00 AM anyone know there damage now? 1:05:00 PM further more if something is spawning a baby frequently and the nest isn't too hard to find , then it is no longer hard to get thus not a rare. Reguardless how messed up a given system is controlling there spawn rates...this does not mean they can return as a rare spawner, but til they are , they are not a rare. 8:55:00 PM first of all this post was pre CU so the spawn rares were not messed up at the time of the post, they are easy to get, which should remove them from the "rare list" if you think about there is only 1 rare from a nest as far as i've found it, and that is the archne queen, the only other rares are those static only spawners, everything else for the most part is semi rare in in a few cases, and for the vast majority common. 1:06:00 AM Why are these considered rares i seem to stumble on about 3-4 nests withthese every time i'm on dath, and and 3 out of 4 nests spawn a baby that usally tames if your a master CH. i can easily tame 2-3 babies of these in 2 hours of not looking for them but merly stumbling on there nests sites, i've so far have given away probally 20 of these free to any one i see that ones them. I personaly thing there ok as a pet, but don't usally keep pets without armor...if you want a gaping spider get the gaping spider recluse..you can even get mission lairs for them and those do spawn a baby 1 out of every 2 nests or so..also noticed they spawn babies 2 at a time on the average. 12:07:00 AM I updated the stats on the Queen. She does not have strong disease, she has medium poison. 8:31:00 PM I finally got mine yesterday. My friend who is a ranger found a baby on his second lair and tamed it for me. I was so happy. I named Her Yzma because shes ugly beyond all reason! 1:30:00 PM I got my Gaping queen the other day, after looking for about 2 hours, I saw a lair on my raday so I tabbed it up an dit was an Insect Hill, so I drive a bit closer and I see 2 yellow dots opo up. I think hmm probably just 2 gaping soiders as I see 2 babies outside lairs fairly often. I tab one of thr dots and it is a gaping spider and then I tab the otehr and I see the word queen. 30 seconds and an Almond Muchie Crisp (or what ever they are called) I have one more pet marked off my list. 2:23:00 AM I am sooo angry at the world right now. The other day i was simply doing lairs around the nightsister outpost cause you have to get the ones with a queen 2 gapings and a broodling anyway on my 3rd one that day I was just doing it slowly cause i had no buffs and had 2 of my pets out to help. I got incaped and im watching my klick getting owned when I see a baby Queen run by and attack it. I thought it was all over but then my pet got incaped and my other was just standing around. When i get up i whip out my taming clothes and mask sent i was standing infront of the baby when BAM! i get incaped again, but i get right up somehow and then BAM! incaped and died. I thought if my pet stayed incaped and doesnt self store im good but when i cloned he self stored i headed back and no lair and no baby... my search continues sadly..
9:48:00 AM Honestly, why would someone want a queen with no armor and less damage instead of a recluse that has light armor, hits for more, and has poison spray? I mean, unless you want knockdown, I guess, but Gurrecks have knockdown and are only a few levels more. Recluses are much easier to get, too. Am I missing something? 1:14:00 PM While on my futile search for a bull rancor baby(starting to get ridiculous)I happen to notice a insect hill with one of these outside, was the first time I've seen one outside that static one with the 4 recluses. Killed 3 of them and the next spawn was a baby) tamed on the first try - the recluse took alot more times. I guess they wouldnt let something like this have light armor due to the high energy and kinetic resists, should have it though. The nest btw was spawning broodlings and regular gaping spiders as well. 6:57:00 PM I have yet to see one of these. I'm almost master CH and am going to take up BE. Would this be a good DNA sample??? 1:42:00 PM update for more accurate ham based on baby stats. 4:58:00 AM I had a chance at one today, asked the ranger in the group. Do you seen a bull rancor baby or a Gaping spider queen baby. 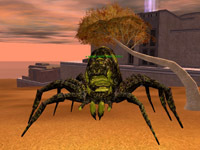 Why hey theres a gaping spider queen on track right this way. We spawned one. They shot it. I hate people. 5:22:00 PM These are rare baby spawns. Star Wars Galaxies1 is a registered trademark of Lucasfilm Ltd.1 and Sony Online Entertainment1All rights are reserved.